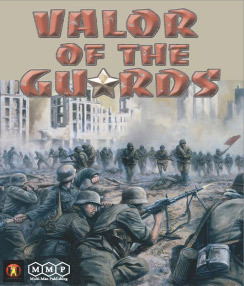 Of all the different items of “ASL vaporware” over the years, Valor of the Guards is one of the most infamous, second only to Armies of Oblivion. Yet VotG differed from AoO in that the latter was vaporware for so many years primarily because of a lack of people working on it, whereas VotG was seemingly being worked on forever. Its origins and antecedents date all the way back to the “Central Rail Station” project that appeared in the On All Fronts newsletter in the early 1990s. 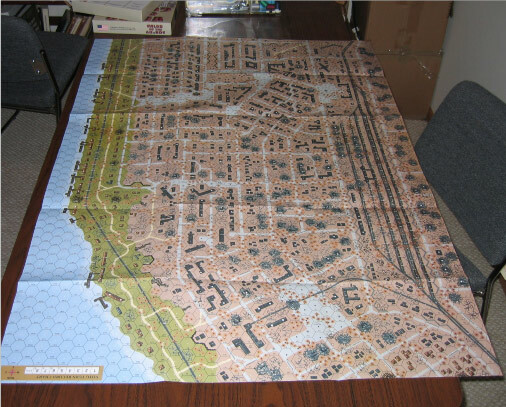 With a subsequent map from Don Petros, Tom Morin took on the task of making a full-fledged historical module out of it, aided by Vic Provost and the “Bunker Crew” and many others. For years, players could occasionally see playtesting of the module going on at ASL events, or hear references on-line to work being done on it, but it seemed like a never-ending project. Finally, however, Tom Morin turned the game in to MMP and ASLers around the world rejoiced, thinking that its release would finally be imminent after MMP put the game up for pre-order and it had thousands of pre-orders in virtually no time at all. However, ASLers did not realize that VotG had simply entered Vaporware 2.0, as it languished for two more years at MMP as credit card numbers expired and countenances became crestfallen. Finally, however, just as in Charlie and the Chocolate Factory, when people began to notice signs that Willie Wonka might have re-started his chocolate factory, ASLers began to see signs of VotG-related activity at MMP in 2007 and it seemed that the long-awaited module might finally debut. Debut it did at the Winter Offensive ASL tournament in January 2008, to great acclaim. It is impossible to say that any game that took so very long to come out is truly “worth the wait,” but VotG is nevertheless undeniably of great value (literally, too, in the sense that it is underpriced!). It is chock full of components and every aspect of the module seems filled with tender loving care. It was also, frankly, a needed boost for MMP, whose record in developing and publishing historical modules had been a bit spotty. What is Valor of the Guards? It is a historical module set in Stalingrad depicting German attempts to capture sections of downtown Stalingrad, from Pavlov’s House to the Stalingrad-1 Rail Station. Scenarios range from the early German attacks in September 1942 all the way to the reduction of the final pockets of the encircled 6th Army by the victorious Soviets in January 1943. Most ASLers, of course, will know that the first and most famous ASL historical module, Red Barricades, was also set in Stalingrad, and may wonder what this module has to offer that is truly different. That is a difficult question to answer. The creators of VotG, of course, assert that it has a very different feel, and it is true that whereas the Red Barricades map was dominated by large factory buildings, the VotG map contains smaller buildings and more open areas. Nevertheless, the module is reminiscent of Red Barricades in many respects, from the map artwork to the basic situation (Soviet-German urban combat in Stalingrad in 1942). And the terrain in both VotG and Red Barricades contain a similar rubble/debris/shellhole strewn landscape. People who have played Red Barricades will feel instantly at home in VotG; even one of the scenarios, VotG1 (The First Bid), contains a title reference to RB7 (The Last Bid). Though the two games do not connect (the two areas were far apart geographically), Valor of the Guards is indeed a “sequel” to Red Barricades. People who disliked Red Barricades are not likely to embrace Valor of the Guards. 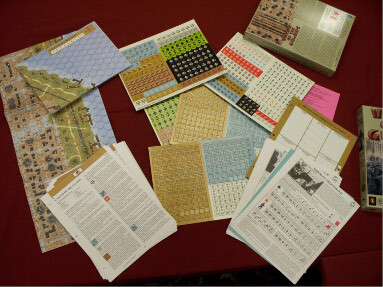 In another sense, the question of how much the two modules are different is somewhat irrelevant, simply because even if they were hardly different at all, the subject matter itself is so popular among ASL players that another Stalingrad-related module would attract considerable support and interest. 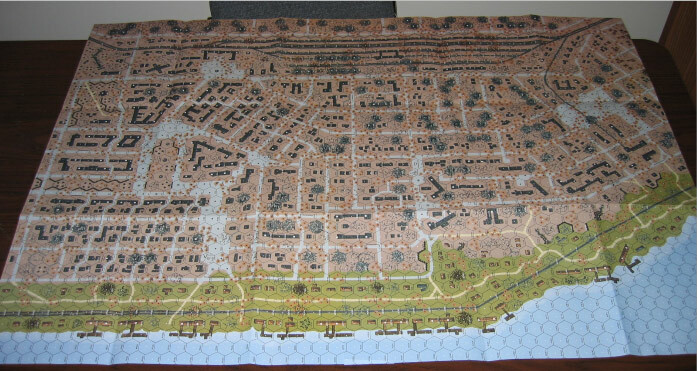 The large two-part map, hand-painted by Don Petros (in what may well be the last hand-painted official ASL map release), is attractive (though that seems like a strange word to use for the rubble strewn terrain of Stalingrad). Like Red Barricades, it depicts a stretch of Stalingrad adjoining the Volga River (including ferry crossing points, which can play an important role). The attention to detail is admirable. In a nice touch, geographic areas such as streets and significant buildings are labeled, so players can easily identify the Brewery, Pavlov’s House, the State Bank, and other features. Even the standing buildings have a distinctly battered appearance, as the shapes of some suggest corners sheared off, while many other building depictions are actually Gutted Buildings, the artwork for which closely resembling the look of such buildings from aerial photographs. Overall, the map is very nice, though it should be noted that some people have complained about the visibility of some map features, such as gutted buildings and trains. VotG comes with 5 full countersheets. 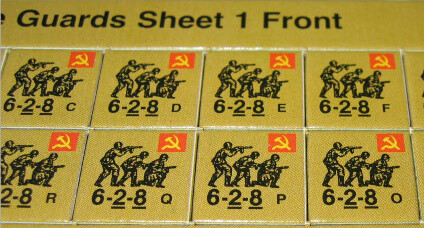 Sheet 1 contains hex control markers and a few other markers, but primarily contains German and Soviet (mostly the latter) units and weapons. The Soviet markers include a new squad type, the NKVD squad, which is a 6-2–8 squad (note no assault fire) with a hammer & sickle flag on the counter. Its reverse side morale is 9 (and all its officers are commissars!). There is also a new, “crappy” commissar (8+1). Sheet 2 contains a few German AFVs (nothing interesting; there is only one new vehicle type, a modification of a German AA halftrack), but mostly markers, ranging from No Move and Trench counters to new items such as “Interdicted” markers (for ferry piers) and “Fanatic Strongpoint” markers. 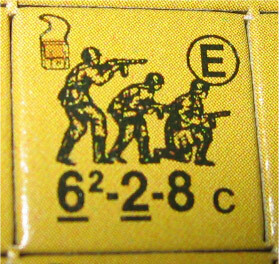 Sheet 3 consists mostly of control and other markers, but also introduces special counters for German and Soviet Assault Engineers (presumably to differentiate them from other, similarly valued counters on the mapboard); these counters depict a DC in the upper left hand corner and include increased smoke exponents. Sheet 4 is just a passel of extra German and Soviet squads and SW. Sheet 5 is another informational marker sheet which looks as if it came from Red Barricades. 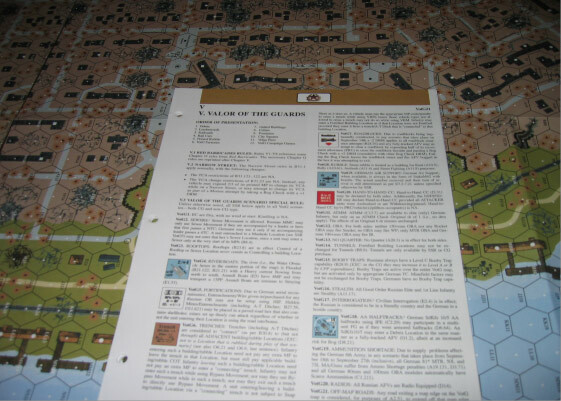 The VotG rules explain the new counters and features, but focus on the terrain. Strangely, rather than incorporating rules for terrain types such as debris into Chapter V, the rules simply reference the relevant Red Barricades rules. However, since MMP could not guarantee that purchasers would actually have Red Barricades (which has been out of print for some time), they reprinted those pages of the Red Barricades rules for inclusion in VotG, which as a result comes with about 6 Chapter O pages. It would have been more convenient simply to incorporate the debris, etc., rules into Chapter V. New features include rail cars, partially collapsed buildings, gutted buildings, fountains, ciy squares, and Volga piers. However, it only takes 4 pages of rules to explain all of this (plus the 6 Red Barricades rules pages, of course). The vast majority of the rules are reserved for the campaign games (although a few of the campaign rules seem to get used in scenarios as well). 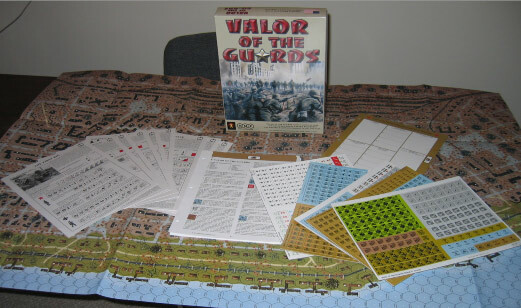 VotG comes with 4 campaign games, one more than Red Barricades. Campaign game rules introduce fanatic strongpoints (of three types) and ferry landings. Campaign Game I (The Central Railway Station) is 8 CG dates long and features the German attack on the Stalingrad-1 Rail Station and the Nail Factory in mid-September 1942. It only uses part of the map area. Campaign Game II (Drive to the Volga) is 9 CG dates long and apparently uses the entire map area; it seems to be a wider version of CGI. Campaign Game III (Battle along the Riverbank) is a shorter CG set later in September; it has only 5 CG dates and uses the whole map. The fourth campaign, CGIV (Savage Streets of Stalingrad), combines CGII and III into one larger campaign from September 14-27, 1942. Like Red Barricades, the campaign games all depict periods of German attacks. Perhaps some day someone somewhere will set an ASL module in January 1943 when the Soviets were on the attack. Don’t hold your breath. At least VotG does have a scenario from the last days of the encirclement, which is more than any other project has. Overall, from its title to its arwork, VotG is refreshingly un-Germanocentric, unlike so many other ASL products. One area in which VotG differs–and in a positive way–from its predecessor Red Barricades is in the number of scenarios that come with the module. VotG comes with 17 scenarios of a variety of sizes which collectively offer more and better playing opportunities than did the scenarios in Red Barricades (which had a weak collection of scenarios). The scenarios tend towards the very large in size; only 6 could be considered small or medium-sized, while another 6 are large in size, and 5 more are what could only be considered “extra large” scenarios. VotG1 (The First Bid), for example, is 19 turns long and features 100 Soviet squads, 10 guns, and 13 AFVs defending against an attack by 81 German squads, 2 guns, 21 AFVs, plus OBA and Air Support. VotG12 (Siberian Shockwave) depicts a Soviet attack with 44 squads and 4 guns against German defenders that include 36 squads, 2 guns, and 4 AFVs. The Soviets have OBA while the Germans have Stukas. VotG9 (Eviction Notice) is the tournament-sized scenario that will probably see the most play. (2014 update: Yup, that was prophetic) The majority of the scenarios are pretty balanced, though there are a couple of dogs in the bunch. OBA is present in 4 of the 17 scenarios, Air Support in 6, Night Rules in 3, and Boats in 3. Interestingly, Soviet attacks far outnumber German attacks in the scenario selection, so scenarios rather than campaign games may be the preferred option for people who want to see the Soviets on the offensive in Stalingrad in VotG. Overall, the production quality and attention to detail is high. Assuming the scenarios and campaign games are as good as advertised, this module is likely to be one of the more popular ASL modules. Red Barricades fanatics in particular may be attracted to this module, as it offers variations on their tried and true Stalingrad battleground. It is an impressive release and well worth the price. Three more VotG scenarios, designed by the makers of VotG, are included in Issue #23 (September 2006) of Dispatches from the Bunker–an issue that appeared long before VotG itself actually did! These are: DB054 (Soldiers of the 62nd Army), DB055 (Sturmgeschütz Forward! ), and DB056 (Breakout from Stalingrad-1). 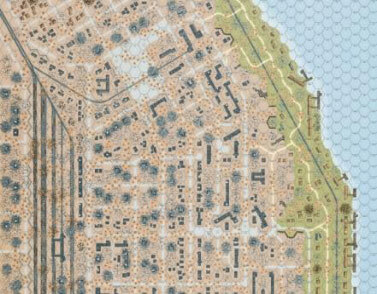 Another VotG scenario appeared in Issue #28: DB073 (Urban Nightmare). Another three VotG scenarios appear in ASL Journal #8: VotG19 (Cellar Dwellers), VotG20 (Terror at Twilight), and Votg21 (Defending the Voentorg). Another three VotG scenarios appear in ASL Journal #9: VotG22 (Bark You Dogs), VotG23 (Heroes of the Soviet Union), and VotG24 (Raid on Rodimtsev). Another VotG scenario appears in ASL Journal #10: VotG25 (Urban Nightmare). Two more VotG scenarios appear in ASL Journal #11: VotG26 (Bad Day for the Luftwaffe) and VotG27 (Drama, the Park, and Deadly Things). has anyone tried playing this to see if it is any good? I tried scenario 1, was bored by turn 6. Eventually 2 weeks later gave up in total boredom at turn 14. The CG1 seems mad too. Over the course of 8 days you can purchase 3 axis inf. companies. What is even madder is having to role for huge CPP allotments to purchase units that are not available and so having to spend all those purchase points on useless things you dont need and wont make a blindest bit of difference. Who cares if you’ve purchased 4 artillery modules, to use up cpp points if you can only use 1? Better to have had lower CPPs or have I missed something? Oh the Russians can actually buy 1 inf. company over the same time. WOW!! !